After five fabulous years of feasting, traveling, and dating, The Astronomer proposed that we spend the rest of our lives together in matrimonial bliss. In one hand was a “huge and bloodless” diamond ring, and in the other was a confirmation for dinner at The French Laundry. He made it way too easy to say, Yes. My boyfriend fiancé likes astronomy. I prefer gastronomy. Oh, The French Laundry—it really needs no introduction. A funny thing happened as we walked through the restaurant’s front door; I recognized the hostess. 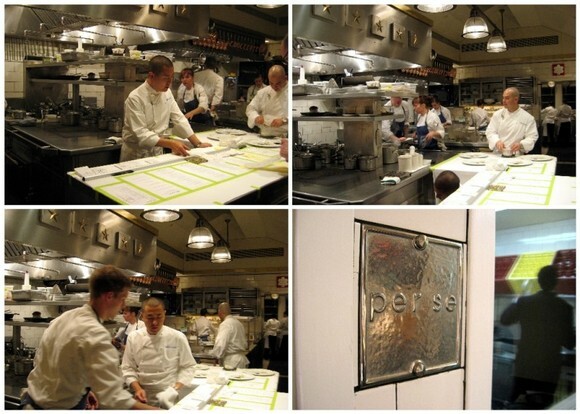 From Mrs. Hayes’ honors biology class to Thomas Keller’s The French Laundry. It’s a small, small world after all. The Astronomer and I were seated in a cave-like stone room that jutted from the first floor’s main dining space. Our breathy-voiced waiter informed us that the room was the restaurant’s original point of entry. We got the party started with some premium bubbly—Pierre Gimonnet Blanc de Blancs from France—because we were celebrating something pretty darn special. 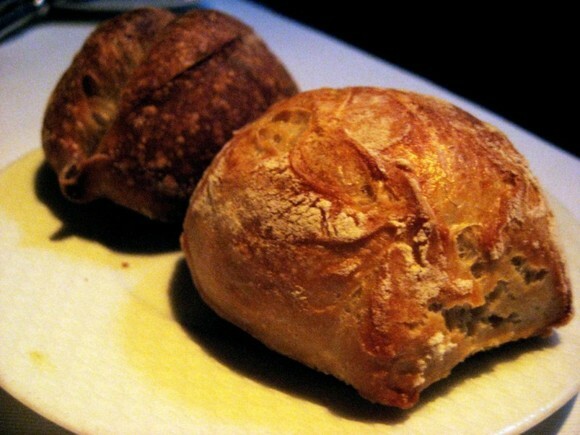 These gougeres were served warm and had an airy touch of salty cheese. Due to their limited size, the flavors and textures ended up being so fleeting that I felt like I didn’t fully taste it. I’ve read so many accounts of meals at The French Laundry over the years that the first few courses were eerily predictable. 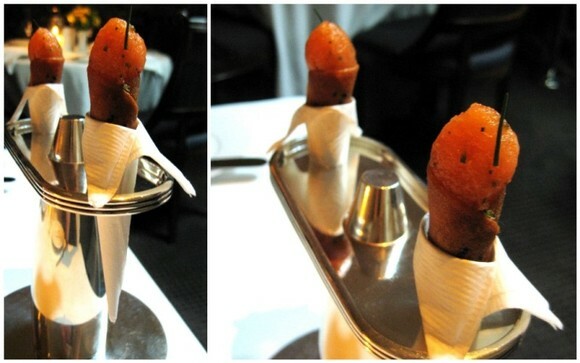 When these adorable canapés arrived, it was sort of like seeing an old friend for the first time. My favorite element of these whimsical ice cream cone-inspired bites was the red onion infused creme fraiche piped into the savory cone. Whereas the gougeres were too small to fully appreciate, the cornets successfully left me wanting another bite. And another one after that. 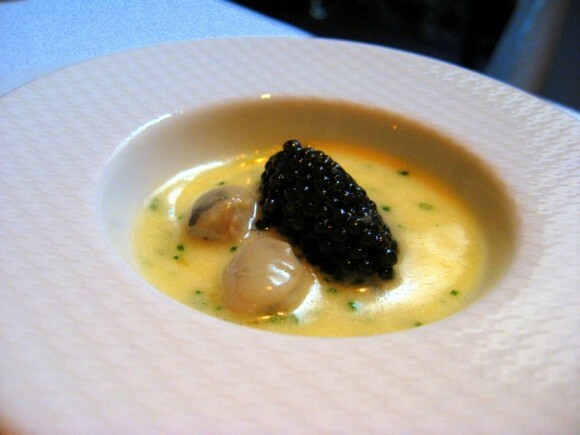 Oysters and Pearls was the highlight of The French Laundry experience for me. As anticipated, the combination of flavors and textures was luxurious. What really excited me about this dish was the temperature at which it was served—the Oysters and Pearls were perfectly warm. The ideal temperature made the flavors brighter and surprised the palate after a series of cooler dishes. Our first bread pairing of the evening was a pain au lait from Bouchon Bakery, which is located down the street from The French Laundry. The roll was light, crisp, and slightly buttery. The pain au lait was served with two types of butter—a locally produced salted one, and a firmer variety made by a cheesemaker. The nontraditional butter wasn’t as spreadable as the traditional one, but it tasted richer and more decadent. The pain au lait didn’t really require any butter, but The Astronomer and I couldn’t help slathering each bite with one of the lovely options before us. Up until this point in the meal, The Astronomer and I were served the exact same dishes. The Chef’s tasting menu allows for diners to choose between two options for a number of courses, so to maximize our dining experience, we each chose different dishes when available and swapped plates midway through. 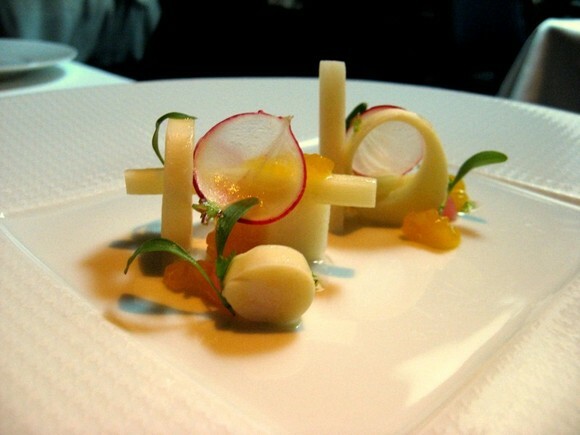 Following the pain au lait, The Astronomer received a hearts of palm salad. We both agreed that the presentation was attractive, but the flavors weren’t very exciting. It’s important to note that Keller’s plates are composed by rejecting any item that, while maybe making the dish more ‘interesting,’ gets in the way of achieving perfection. It was wholly apparent during this course that Keller’s minimalistic vision of perfection differed from my own. Prior to my trip to The French Laundry, my brother Victor, a fine dining veteran, adamantly insisted that we shell out an extra thirty bucks for the foie gras course. I’ve eaten foie gras here and there over the years and have never been too impressed, but he promised me that Keller’s deftly executed fatty duck liver would change my mind for good. 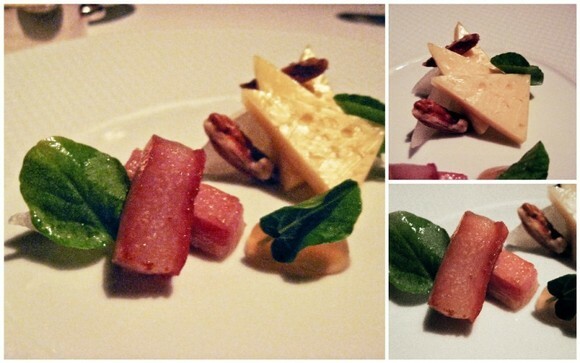 The delicate portion of foie gras was prettily accented with Marcona almonds, celery, and a sweet and tart apricot puree. A thick slice of buttered and toasted brioche arrived on the side, along with three types of finishing salt—gray French sea salt, white Japanese sea salt, and a pink salt from copper mines in Montana. Spread smoothly upon the warm brioche, the impossibly velvety foie gras tasted like an otherworldly kind of butter. The salts and fruit puree curbed the richness, while the celery and almonds reset the palate for more. 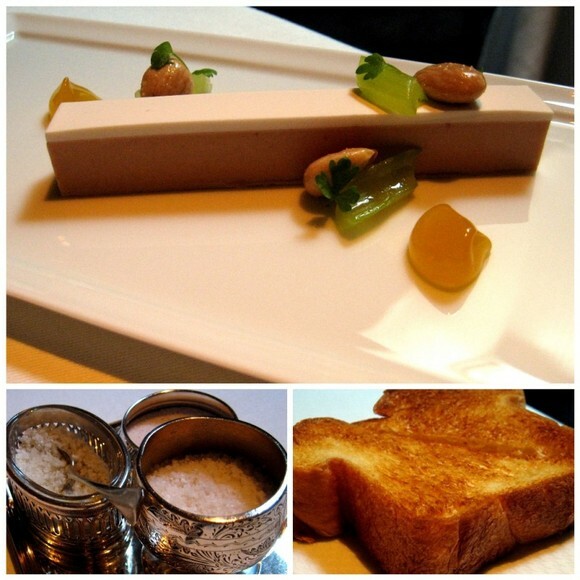 The simplicty of the preparation allowed me to really taste and appreciate foie gras in all of its controversial glory. 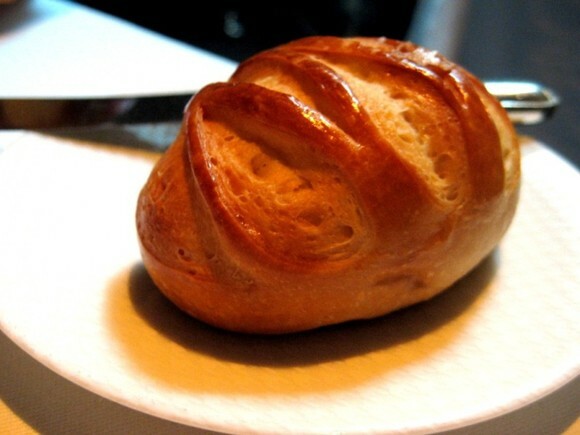 A note about The French Laundry’s superior attention to detail—As soon as I finished photographing the brioche, a waiter swooped in and removed the plate from the table. He replaced it with a freshly toasted slice without saying a word. The photo shoot took about 30 to 45 seconds, which is apparently much too long for brioche to sit idly. Although it was admittedly wasteful, I appreciated that the kitchen insisted that I experience the dish at its peak of deliciousness. For the fish course, The Astronomer was presented with the sauteed fillet of cobia. Although it appeared dainty and supple upon the plate, the fish’s flesh was actually quite firm. 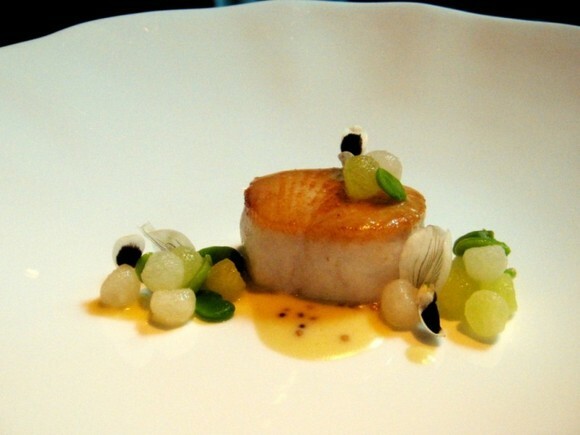 Since I tend to favor buttery fishes with flaky fleshes, this plate didn’t excite me, although I did like the compressed Granny Smith apple and fava bean accents. The Astronomer was pleased with the cobia’s steak-like texture and consumed the bulk of the dish. The tartare of Japanese bluefin tuna was another highlight of the evening. Counter to Keller’s usual philosophy, this plate contained quite a few bells and whistles that made it interesting. The raw cubes of tuna, which were perfectly fresh, had an easy consistency that melted in my mouth. Dabbed in the white sesame sauce along with the oranges, each of the clean and distinct favors harmoniously mingled together. I liked every element of this dish. Following the fish course was another bread pairing. 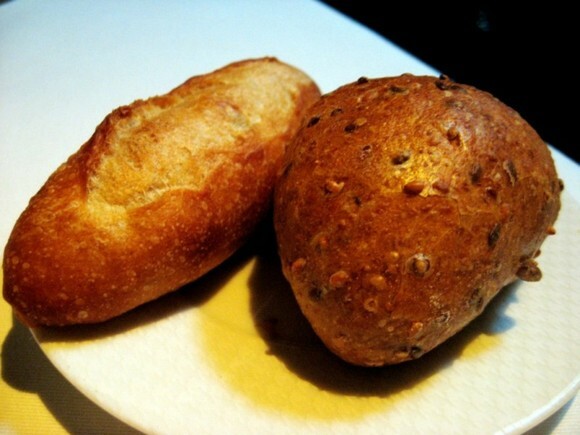 The Astronomer chose The French Laundry baguette, while I went with a multigrain roll. Dinner could have very well ended after this course because in my mind, it’s nearly impossible to top a succulent, butter-poached lobster tail resting in a pool of black truffle sauce. The glazed carrots and English peas brightened the plate beautifully, but it was the sweet lobster tail that knocked this dish out of the park. It was easily the greatest lobster I have ever eaten in my life. The lobster course was a turning point in our dinner; the final lighter course before an onslaught of heavy meats. I adore tasting menus, especially when they’re paced properly, but almost always prefer the first half of a multi-coursed affair to the last. The early notes tend to hit the flavors and textures that I adore most when my tastebuds are ready to be wowed. Though not completely stuffed, I was more or less sated after the lobster, which did not bode well for the meat courses on the horizon. Following the lobster course was another bread pairing. The Astronomer chose a wheat roll, while I went with a sourdough. The sun set moments before the meat courses began. Hence, the shoddy shots. For the first meat course, I received the veal hearts, while The Astronomer was presented with the duck pastrami. The thin sheets of tender veal hearts weren’t very memorable eaten alone, but really came alive when paired with the spicy horseradish. The beets were disappointingly dehydrated, while the potatoes were terrific. The duck pastrami was splayed on a bed of cabbage and topped with a thin and crispy caraway seed cracker. The duck was moist and tender, but the composition of flavors didn’t strike me as anything special. For our second meat course, The Astronomer and I both received a hunk of grilled beef prepared medium rare. Though tender, the texture of the beef wasn’t of the melt-in-your-mouth Japanese Wagyu variety. The rice and ginger sauce pairing struck an unexpected Asian fusion chord, which I wasn’t too keen on. The ginkgo nuts were unpleasantly bitter. 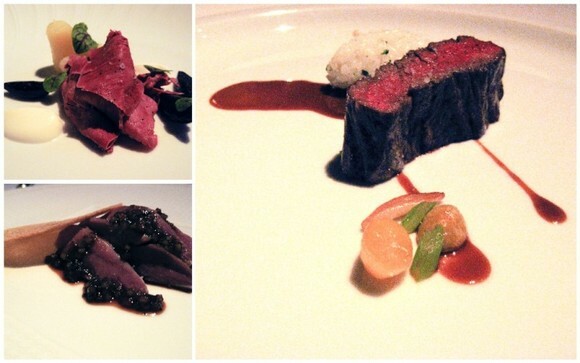 The series of meat courses highlighted how Keller’s aim for perfection leaves the plate a touch too one-dimensional. All of the meat dishes were good in their own right, but none of them managed to excite me the same way some of the earlier courses did. Dining at a gastronomical temple like The French Laundry, I want nothing more than to fall madly for each and every dish. Although experiencing a series of misses is heartbreaking, it truly does give me a better sense not only of the Chef’s vision, but of my own personal preferences as a diner. The Astronomer and I loved everything about the cheese course but the actual cheese. The “beermat” was a firm specimen with an unpalatable flavor. We tried to mask the unpleasantness with honey, bacon, nuts, and fruit, but after two slices each, we had to admit that the cheese was an acquired taste. This was the only course that we didn’t finish all evening. A buttermilk sorbet arrived next to cleanse our palates as we transitioned from savories to sweets. The sorbet’s pervading sourness was jarring at first, but mellowed out after a few bites. I loved how the dish was inspired by high tea complete with cream scones, Earl Grey foam, and fruity preserves. Clever! Both dessert options this evening were a let down. I’m a dessert-lover through and through, so this sad turn of events was even more disappointing than the meat courses. Both the chocolate and hazelnut number and the parfait au citron were uninspired and disjointed. The individual elements that comprised each dessert were decent eaten alone, but never managed to meld together into a satisfyingly sweet package. This style of arty plating worked for most of the savory dishes, but came together poorly for the desserts. Dessert was followed by mignardises, tiny, bite-sized sweets to end the meal. First, we indulged in some fine handcrafted chocolates. We chose a peanut butter cup, salted caramel, white chocolate with yogurt, and lime from the selection. 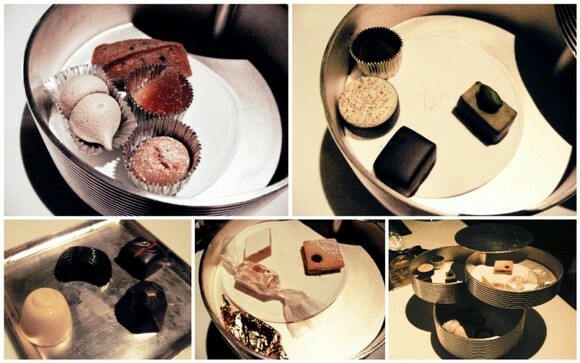 The chocolates were served on a chilled silver platter, which was a very nice touch. The chocolates were followed by little candies presented in a three-tiered silver box. I liked the drama of the presentation, but the nibbles inside weren’t as unique as their container. Lastly, the maître d’ led us into The French Laundry’s kitchen for a mini-tour. The space was clean, calm, and warm, but I felt awkward gawking at the cooks and wanted to hit the road straightaway with my shortbread cookies in hand. I walked away from my dinner at The French Laundry pleased that I had finally experienced the culinary mecca, but somewhat bothered that I didn’t fall head over heels for the place. At this level of dining, the food, service, and ambiance are a reflection of the Chef’s personality and intentions. 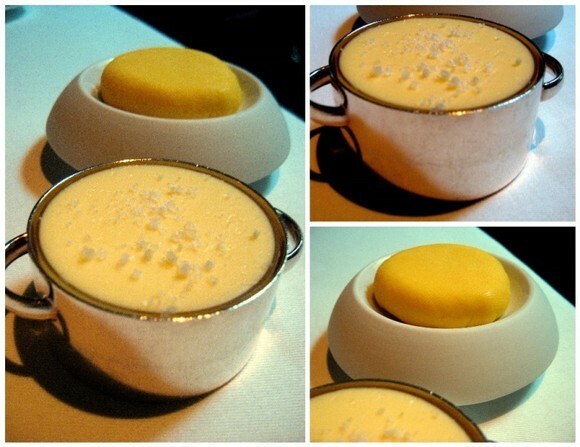 In the case of The French Laundry, I have to admit that Keller’s perfectionistic style didn’t quite gel with my own. Wow, congratulations you two! I’m following your blog now since I moved away from home to go to college. Your blog really comforts me, when I have a craving for vietnamese food. Unfortunately there is only a small Viet-Community here in Germany, so no nice Pho-restaurants for me. :/ But reading about your foodadventures is a good substitute. Best wishes, M.
Dude. When’s the Astronomer going to propose to me? Ha. Sounds like you had the meal of a lifetime! I’m pretty sure that Snake River Farms is Waygu Beef. Maybe they do both but I think that’s one of their things and I can’t imagine TFL not using it even if it’s an option. Hey best wishes to the gastronomer/astronomer team! sounds like you had an exciting trip up north! I tried a few times unsuccessfully to get reservations at the laundry and am now content to say I tried… so it’s always fun to read about it secondhand! too bad to hear you had such a mixed food experience, but it sounds like a memorable meal – congratulations! Congratulations!! My boyfriend and I are moving from Philadelphia to Los Angeles quite soon. 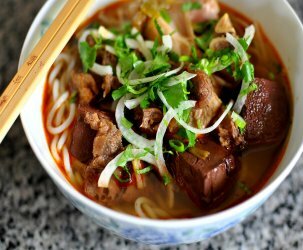 L.A.’s my hometown, and seeing your posts, particularly the ones about delicious Chinese & Vietnamese food, make me miss home. I’ll be in Vietnam this summer, so I’m also using your blog to navigate Hanoi and Saigon. Anyway, best wishes to you two, and I hope there are many more delicious meals in store in your future. 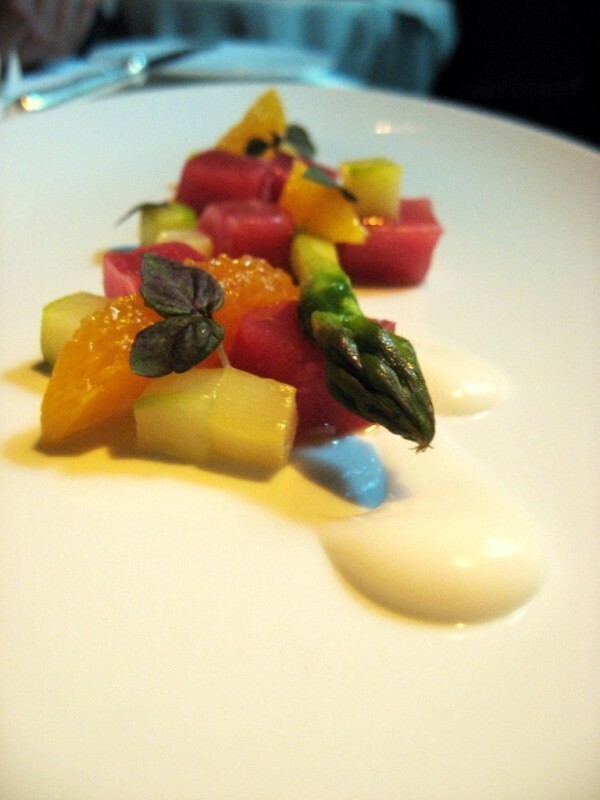 BTW, have you tried Michael Mina at the Westin St. Francis Hotel in Union Square SF? I really enjoyed my Christmas Eve dinner there. 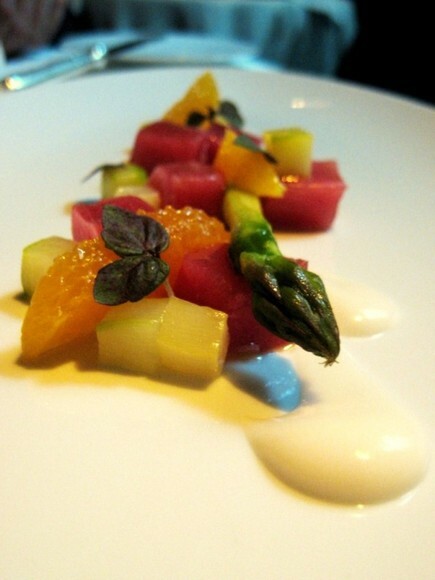 I’ve been looking forward to The French Laundry post and was presently surprised about your exciting news! Congratulations and best wishes to you both! Epic post! What kind of Champers did you toast with? Congratulations! 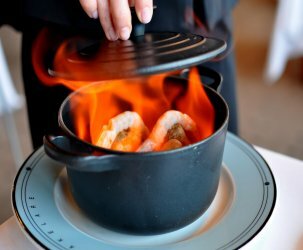 I sometimes find that these fine dining experiences are focused so much on wowing the diner with unique presentations that they lose focus on the actual tastes. It sounds like it was a worthwhile experience in that it allowed you to learn something about your dining tastes. de-lurking to say congratulations! What a nice way to celebrate an engagement. 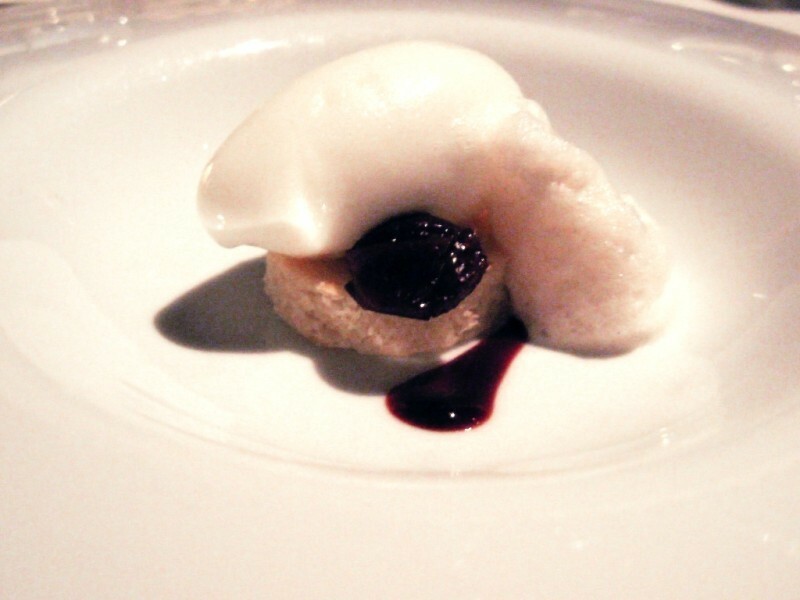 We have reservations at The French Laundry for this coming June…I’m excited! Congratulations! How wonderful. And a beautiful non-bloody ring. Sorry about the dinner – but it sounds as if portions of it were just as wonderful as you expected. Perhaps anticipation worked against you this time. Congratulations, you two! What a fabulous way to propose (and to be proposed to)! not gonna say it again since we’ve already gave you congrats toast… is it even worse now because FL fell 7 places this year? I have been a long time reader of you guys, but too chicken to comment! Nothing bad to say to the two of you, just rather observe. But I do have to say CONGRATULATIONS! I wish you both nothing but lots of love, laughter, success and happiness in your lives!! Congratulations! What a great, romantic place to celebrate! Congrats Cathy & Vern! Where will you go on your honeymoon? congratulations! what food will you have at your wedding??? congratulations to you both… you two are so damn cute together! Congratulations from Oishii Eats and I – to many years of delicious adventures. We now know that your fiancee at least had this set up 3 months ago since it takes that long to eat there ha. So he definitely put some time/thought into this. Hey girl!!! It was sooo nice finally meeting you two last night. You are just so super sweet. Congratulations!!! Enjoy your engagement! Yay that I finally got to meet you last night!!! Boo that I didn’t get a chance to talk to you more! Oh well, hopefully there’ll soon be a next time. 🙂 Congratulations on your engagement!!! OMG!!! Congratulations!!!! I started following ur blog for almost a year now. Don’t know if u remember but back in August 2008 my bf& I were going to Vietnam but unfortunately we couldn’t meet up bc u guys were heading to China. Im so happy for u guys!!!! (even though we’ve never met) Congrats & all the best to u both! Holy crap. I’ve been completely remiss in not checking your blog for so long, and look what I missed! I agree that the menu can lead one to wonder what is the big fuss about; but I think it takes a few meals to really appreciate the restaurant (probably not unlike most restaurants.) I had the beef recently and it was one of the best pieces of beef i’ve ever had – incredible flavor – very intense dry-aging. I love your review of the French Laundry…I have never been, yet I feel I need to exprience it. I love the fact that you weren’t blown away…Anyway, great review, hope to get there someday. Love the great photography! Thanks!! And congratulations for your blog!! How did you get the kitchen tour? David – I sensed that we were taken on a tour of the kitchen in order for the waitstaff to turn our table since we dined during the first seating. I’ve heard that you can also request a tour. So how did your situation turn out? Hope it went well. We have a similar situation also. We booked a table for four so we need two other dining companions for lunch on March 3. Does French Laundry forfeit your reservation when fewer than the number of guests arrive? Do they charge a cancellation fee on top of the forfeiture? I’m beyond jealous. I’ve dreamed about the French Laundry, but I live on the other side of the country, and it’s far too expensive for my wallet. I have been to Keller’s Bouchon bakery though, and it was phenomenal. I’m so glad to hear you had a great time! We are a couple from London coming to California to get married at San Francisco City Hall in June. 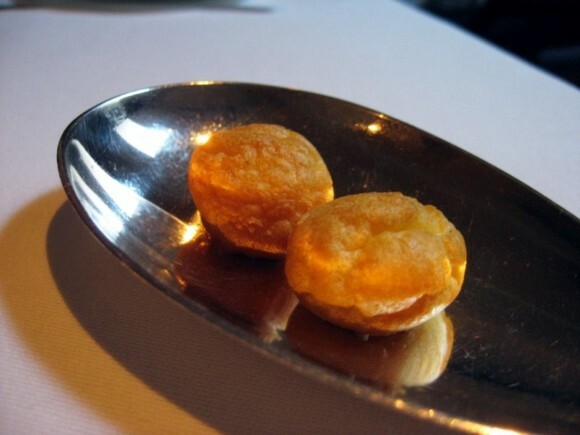 Really hoping to get French Laundry reservation for June 25th….obviously can’t book until 25th April. Does any one have any tips for booking online? I’m keen to know if the date goes live at 12:01 Pacific Time or 10am – ie the same time as when the phone line opens? Anyone know? We are a couple from Folsom looking to celebrate our 25 year anniversary at the French laundry with another couple. We’ve been planning this for a year now. Just tried to get a reservation for 4 at 6:00 P.M. on July 16th, 2013 but no luck. Tried thru Open Table right at midnight on May 16th and no luck. Appreciate it if someone has any tips to get this reservation for us. We will call the reservation line at 10:00a.m. and hope for the best. we are couple from Sacramento area and would love to get a reservation for 2 any time over the next 2-3 months on Weekends. Anybody any idea how to get this please send me a message. Getting your cancelled reservation would be very much appreciated. Hello, we are visiting the US for our honeymoon and would love to dine at French Laundry on 30 Jun – 1 July – 2 July. If anyone has a reservation they wish to cancel could you very very kindly pass it to us? Thank you so much! If anyone has a cancellation for 2 from June 30 to July 3 please contact us at patelnews at gmail dot com. We are celebrating big milestone and want to make it special. Flexible on time. Thank you!! Hey! My fiance (soon to be husband) and I are going on our Honeymoon to Sonoma, CA (From Philly!) 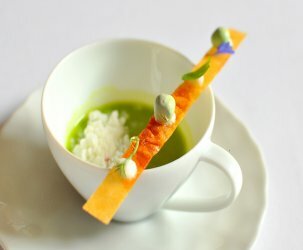 and would LOVE to eat at French Laundry any day between August 26, 2013-August 30, 2013. I tried to make reservations on-line, but they must go in like, an hour!! Let me know if anyone has any!!! I am trying very hard to book a reservation at the French Laundry to surprise my husband for our one year anniversary in September. We will be in California between the 14th and 22nd of September and we will take ANY reservation during this time (I will actually plan the entire trip around it!). I’ve been trying to make reservations over the last week but I have failed miserably – if anyone can help, I would REALLY appreciate it! Like many of you, I’ve been trying endlessly to book a reservation at The French Laundry; surprise celebration for our upcoming 1 year anniversary! Would love 9/29/13 (any time), but anytime on 9/27-9/28 would work as well. Thanks in advance, and good luck to all those hunting as well! I have a reservation for 2 on 10/12/2013 (lunch 11:45am). I would like to swap with 10/11, 10/4, 9/27 for lunch. I have been attempting to get a reservation at TFL for some time now and would really love to have an opportunity to visit anytime between now and end of September if anyone has a reservation they need to release. My fiance royally surprised me for my birthday (designer gifts, fine dining, amazing flowers, wine, champagne, the works!! 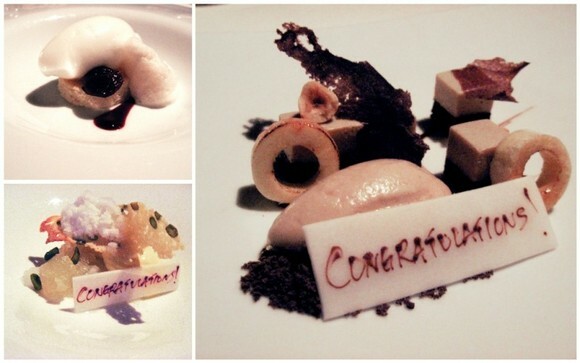 ), the only way I could think of to say “Thank You” is to treat him for dinner at The French Laundry. I would appreciate any assistance from fellow foodies! I am in that ever ongoing wait list group, as well! 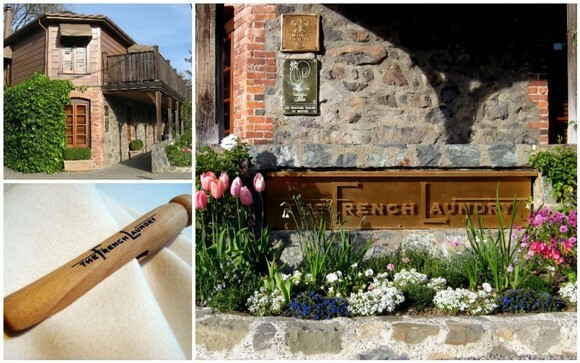 I was hoping to check The French Laundry off my husbands bucket list for his 50th and have been unable to get an opening – I have 4 on wait list but can do 2 looking for anything between Sept 19 – Sept 22 2013. Thanks for any help and good luck to everyone in trying to get their chance at this once in a lifetime experience. My wife and I would love to share a reservation with another couple or large party on either 10/26 or 10/27 2013. Tried unsuccessfully too book a reservation. This is our last place to try in the Keller dynasty. We can offer up good manners and good conversation if you are interested. I am also looking for an October 1 dinner reservation for 2. Would appreciate hearing from you if you have one available! I’m looking to surprise my soon to be fiancé with a celebration dinner at The French Laundry around Nov 23rd. Please let me know if a reservation is available. Thank you! Taking my mother for her dream trip to San Francisco. Any possibility of a dinner reservation at French Laundry for Oct 29, 30 or 31? Any help to us starving Canadians is tremendously appreciated. My husband and I are going to Sonoma next week over Thanksgiving for some much needed R&R and will be there until Sunday evening. If anyone has a last minute change in plans and could pass a reservation on to us for a table for 2, this would be fantastic!!! that I can not use. Is anyone interested? I have a reservation for 4 on Sat Jan 18th @ 8:30pm. Does anyone have a party of 2 that would like to join? Hi I am looking for lunch or dinner reservation (any time) at French Laundry from April 10 – 13. Anybody have a reservation for party of 2 by any chance? Hello! If anyone cancelling their FL reservation for 2 on Mon-Tue Feb 17-18 for 2, please let me know at [email protected]. Hi. Asking for something first without knowing how/what to give in return is a new (and a little awkward) experience for me, but I have a short window in order to get a reservation at the French Laundry (the long-distance bf will be in the US for 3 days and it will be the last time he sets foot in the same country as me for min. 2 yrs, this is not meant to be a sob story, it’s just to give you an indication of our limited time!) so I’m willing to try anything (well, almost anything lol) to increase my chances, in addition to hoping for the best online and via phone. I am hoping to get a reservation at the French Laundry for Monday April 28, 2014, completely flexible on the time, less flexible on the date, but still open to eg Sunday April 27, 2014. If anyone has a (complete or partially cancelled) reservation and would like to bequest or spend the evening with a young, well-traveled couple, please kindly feel free to email me at [email protected]. Need a dinner reservation for 3 anytime between June 1-June 3rd. Desparately seeking reservation for May 24th or thereabouts. (Memorial Day weekend) Wife and I taking vacation to Napa for first time in many years. Have tried calling for a couple months without luck. If anyone has a reservation would be very grateful. Thanks in advance! I am hoping to find a reservation for two any lunch or dinner from dinner June 21 through lunch on June 25th. You will make a culinary student very happy. 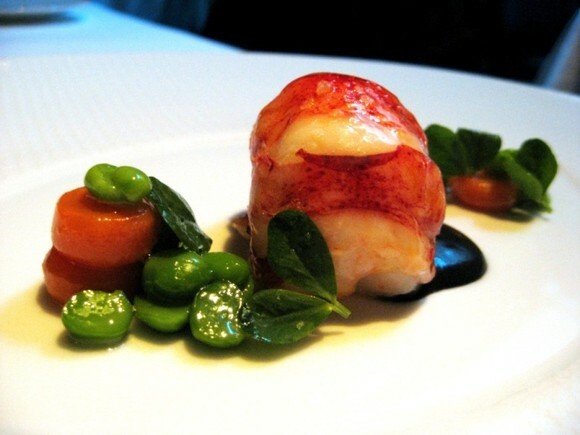 Desperately Seeking a reservation to French Laundry July 17-19 anytime. Anyone… Anyone? I am celebrating a birthday in Napa and really want to go there to celebrate…I am going to be there July 27,28,July,29….Please let me know if anyone can help. I know this is very last minute, but I need a reservation next Tuesday or Wednesday July 22nd or 23rd for my anniversary! Please email me at [email protected] if possible. Need a 2 person reservation for 9th or 10th of August, or 21 August for part of honeymoon. Didn’t realise the wait times! Any help to [email protected] please. Thanks! I’m flexible for lunch or dinner on Oct 25th and Oct 26th. Does anyone have a reservation you are not going to be able to use? Please email me at [email protected] if you have one! Thanks in advance, your help will be really appreciated. I am looking for a reservation on 12/31 for an anniversary/NYE dinner. Please email [email protected] with any help. Thank you! I need a dinner reservation for 2 for Nov 25th at The French Laundry. If you only have lunch please let me know. I plan on proposing and need a reservation for 2 people for 6/12/15 or 6/13/15 for dinner for anytime. Please let me know if you can help. Thanks! My wife and I have a table for 4 on July 16, 2015, @ 5:30 and are looking for 2 people who would like to join us. Looking for a reservation for 2 or 4 any day/ any time between 9/4-9/7. Any help/suggestions are so appreciated! Looking for Reservations for 2. Anytime for dinner 9/6/2015. Thank you! Looking for reservation for 2 on Sat Oct 3 for anniversary. Open to any time of day. Looking for a reservation on Sunday Oct. 4th – any number of people and any time. Looking for a reservation for two on either October 13th or 14th, any time. Flying in from Canada for a 10th wedding anniversary trip. Was hoping to make it the highlight of the trip. I have a confirmed OpenTable reservation for Wed. Oct. 7th 2015 at 5:30pm for 4 guests. There are just 2 of us and we are willing to share with 2 more people. We are a gay couple in our 40’s from Canada. Hi, looking for a reservation for 2-4 people on any day within the next month for dinner (15 Sept – 15 Oct). My sister’s birthday is coming and wanted to surprise her. Hi all! Looking for a reservation for 4 on Oct 24-26. Open to lunch or dinner. Celebrating birthday weekend and this would make our weekend, nay LIVES, if we could pull this off! Looking for a reservation for four people on Thurs Oct 29. celwlu at gmail.com Thanks so much! Looking for a dinner reservation for four on December 19, 2015. This is great! I love the community here. I’m looking for a reservation for dinner for 6 people for Saturday May 28th, or Sunday May 29th (2016). Please email me at [email protected] if you have a hot tip or a reservation you’d like to offload. Hey all, had some friends cancel out on us so we’ve got 4 extra spots at our table for 6 for lunch on Saturday 5/28. We’re happy to share our table, or if someone even has a 2 person table they’d like to trade us. Thanks! Looking for a reservation lunch or dinner Sept 2-4 – a pre-deployment dinner for my Navy spouse. Let me know if you have an extra 2 seats. Thanks!! I really enjoyed this play-by-play description of the different courses, I can see why this blog still shows up more than seven years later. The observation on the first half of the tasting menu being more enjoyable is really insightful, I never thought about that before but you’re totally right. Looking for a reservation for 2 or a spots at a table to share December 17-19 for our 1 year anniversary trip to Napa. Please email me if you have any availability: [email protected] Thanks!!!! Was looking to propose or celebrate said proposal at French Laundry on a trip to to Cali from East Coast. Unfortunately, I can not get a reservation. I am looking for two on 4/28 or 4/29. If any one has a opening or has connections that can get me a reservation I would truly be grateful!! Since my g/f may follow this blog (due to the nature of her work and interests) I have created a email specifically for this but . Thank you in advance. My cousin and her husband are coming over NorCal in May and likes to try out French Laundry. Sadly they haven’t anticipated that it is this hard to get a reservation. Was looking for a table for 3 for May 11. If anyone has one and will not be able to make it, please let me know. Hi! 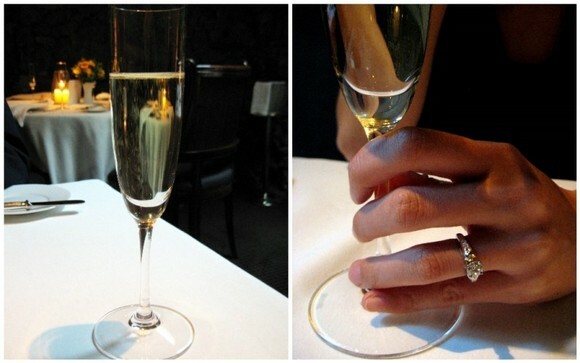 First of all, what a fantastic blog and what a perfect way to propose! Looking for a reservations for two @ French Laundry for October 1st. Please email me if you have any availability or are willing to transfer your reservations. Looking for reservations for 2 on march 15th anytime!